Rather than head down to Hiroshima I decided to go to Takayama after Kyoto. After switching from the wonderful Shinkansen (bullet train) in Nagoya I took a small ?express? train into the mountains. The ride was very pretty but the mountains aren?t as uninhabited as you would think. The Japanese have to use every bit of land they can. Takayama is mostly known for it?s traditional houses. I walked around the area and felt like I was in a zoo. There were only a handful of Western tourists but literally busloads of Japanese. Since there?s two large groups of Australian teenagers staying at my hostel I was surprised to see so few Westerners around town. The town was definitely a tourist town, shutting down at night after the tour buses leave. One major attraction is the Hida Folk Village with plenty of traditional houses on display. It wa since to walk around and the tour groups? pace was much faster than mine so I was able to stay away from them. Nearby is a large temple with a gold, sweeping roof. Apparently it?s been pegged as a cult, but it was a distinctive part of the mostly one and two-story skyline. Out of everything in Takayama I liked the tradtional houses the best. One in particular has beautiful clean lines and a high ceiling. A lot of early 20th century modern architecture the west calls innovative is obviously influenced by houses like these. The hostel in Takayama is part of a temple complex and has very strict rules. The lights were turned off at 10pm and we were awakened at 7am by a flute player. The 15 year-old Australian school group stomped around and hogged the shower and Japanese bath. However, I did meet a great girl about my age from Tokyo. She was also travelling with her iBook and we got them out to compare. I gave her some icons and she gave me some serial software. 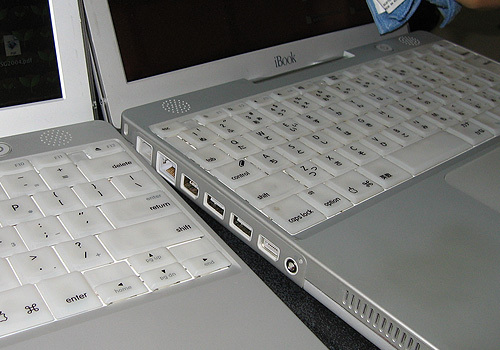 Her keyboard has a slightly different configuration of keys and a much smaller space bar to accommodate the Kanji keys. She called me a geek but I think she appreciated me cleaning her keyboard for her. As some of you know, I try to take a photograph of myself doing a cartwheel in each city I travel to. I’ve amassed a good collection so far–in front of the Eiffel Tower, on top of Machu Picchu, in front of the Statue of Liberty… but this trip I considered stopping the tradition. The entire spectacle feels more disrespectful as I get farther from home. On a more selfish note I have to plan it out, find a place, wear pants, bring along my disposable camera and find someone to take the picture. When I was in Nikko, Japan I visited a lot of the sites with an Israeli man named Erez. He had a very nice Nikon D100 which he used to take a second cartwheel picture. I have gotten in the habit of using a disposable camera for many reasons. It is not valuable and less likely to be stolen by the stranger I’ve handed it to, all of my cartwheel photos will be on one roll of negatives and it’s easy enough for anyone to use. Erez wanted to take a digital picture as well as my disposable camera picture and managed to shoot the entire cartwheel sequence. You can see the cropped pictures below. *This* is the reason I?ve always wanted to come to Japan. It wasn?t the geishas, the samurai or the ancient temples–it was the fashion. I?m not sure that you could call the cosplay kids fashion, it seems like they?re just teenagers that want some attention. In any case I think they?re wonderful, I would have been sitting out on that bridge when I was in high school if I was Japanese. Cosplay is basically a group of kids who like to dress up in costumes or assume characters on the weekends. This usually occurs on Sundays in the Harajuku neighborhood in Tokyo. The was a large range of people and costumes. Some girls were alone and wearing what looked like sheep herder outfits. Some girls were with large groups of friends and took on a more goth or punk look. By Sunday I had grown a bit bored with Tokyo and wanted to make my way down to Kyoto. I only stayed because I knew Sunday was the day to see cosplay in Tokyo. I had saved the best for last and it didn?t disappoint. You can see photos of some of the costumes in the Gallery section. In addition to the cosplay kids on the bridge the neighborhood of Harajuku had just about everything I could want–fast food, junk jewelry stores, sock stores and teen-oriented clothing stores. I was in love. I made a day trip from to Tokyo to a smaller town called Nikko. It is very famous for it?s well-preserved temples. Taking the Shikansen train (bullet train) was great because it goes so fast. I normally wouldn?t travel by the expensive train but I bought a Japan Rail Pass before I left home and it covers most of the rail lines and I am legible to ride it unlimited for 14 days. A lot of walking around the sites was involved and I spent the entire day on the grounds. The most impressive temple contained three large wooden buddahs covered in gold leaf. They sat above the passageway, high above onlookers on their lotus stools. 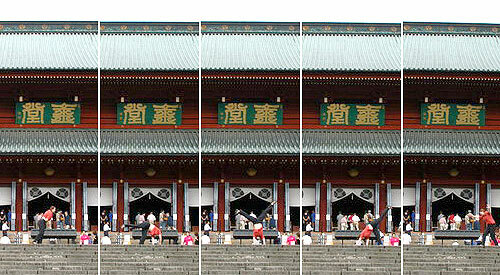 Most of the temples were painted red and much more intricately decorated than traditional Japanese temples or shrines. A vendor on the grounds was selling what looked like beautiful, round marshmallows on a stick. As soon as I handed him my 250 yen he brushed them with a brown-colored liquid. Unfortunately, when I bit into them I did not taste fluffy marshmallows–it was something else, something that may have been tofu and was definitely covered in something fishy tasting. Seeing all of the temples was exhausting and I was glad to make my way back to Tokyo. Apparently there?s a beautiful lake and waterfall in the area but most of you know I?m not the hiking type. Overall, Nikko was a good introduction to Japanese temple design but it turned out to be a much different style than everything else I?ve seen since. Japan has turned out to be a very easy place to travel in. Most signs are also written in English so transportation is no problem. Tokyo is an interesting place. I don?t feel overwhelmed by it at all. There are a lot of people, but I?ve seen worse. Even the process when conductors pushed people onto the metro so they could fit behind the closing doors was entirely polite. The politeness and cleanliness is actually a bit unsettling. The metro is always silent and everyone faces toward the doors. Even the school kids in their uniforms are completely well-behaved. No one talks on their cellphones and no one eats or drinks. The only real problem I?ve had is the food. I just don?t like Japanese food. Ramen is okay, but other than that everything tastes a bit fishy. I started out slow the first day, visiting the Imperial Palace gardens and walking around the shopping district of Ginza. It had all of the upscale shops like Prada as well as the Sony building where I played with gadgets that haven?t been released in America. 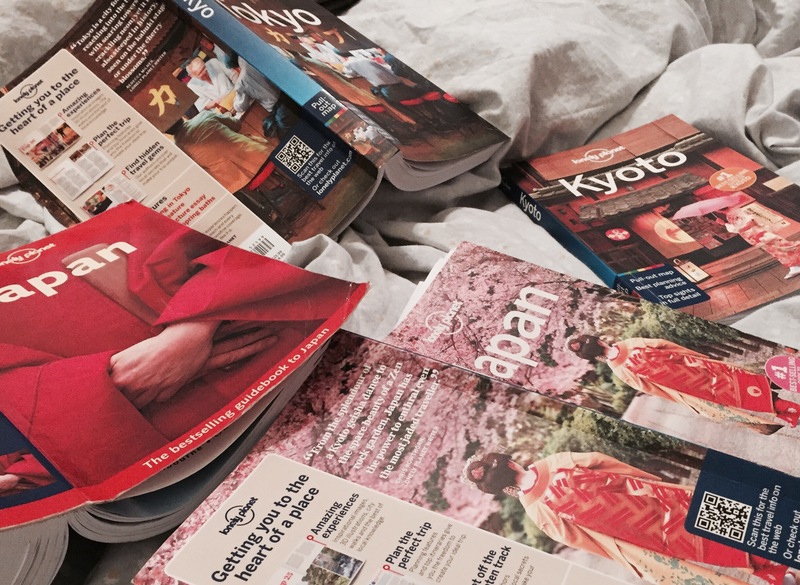 The next day I dove headfirst into what most people think of Tokyo–Shibuya and Shinjuku. These are the areas with huge television screens, lights running along every building and people as far as the eye can see. I don?t understand the advertising ao much, at some point you stop seeing anything because there?s just so much. I almost think a large white billboard would be more effective. I also visited the Edo-Tokyo museum where life-size displays of daily life have been created. The way in which Tokyo was all of a sudden bombed by the U.S. was pretty funny. I’ve taken a lot of pictures with my new digital camera. I’ve posted some of them in the Gallery section. Overall I am surprised at how few Western tourists I?ve seen in Tokyo. Even in hostels I?ve mostly met Germans, not the typical English or Australian backpacker. There is a large number of Japanese tourists however and a lot of the tourist facilities are geared toward them. I think Tokyo was a good way to ease myself into travelling again, I?m glad I started here first.